Crew Arrivals: 5:00pm 6925 Hollywood Blvd. From the film: Dwayne Johnson, Carla Gugino, Alexandra Daddario, Paul Giamatti, Archie Panjabi, Ioan Gruffudd, Hugo Johnstone-Burt, director Brad Peyton, producer Beau Flynn. Guests include Emmanuelle Chriqui, Joel Courtney, Gil Bellows, Malin Akerman, Zach Woods, Mayor Eric Garcetti and Troy Garity, with additional guests to be announced. 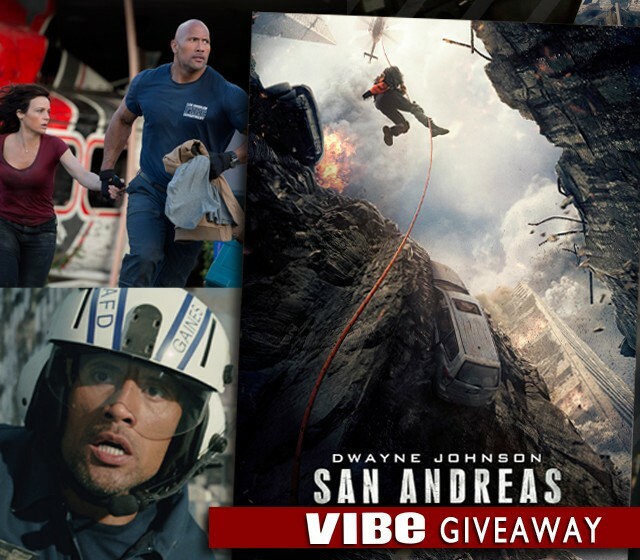 After the infamous San Andreas Fault gives, triggering a magnitude 9-plus earthquake in California, a search and rescue helicopter pilot (Dwayne Johnson) and his estranged wife make their way together from Los Angeles to San Francisco to save their only daughter. But their treacherous journey north is only the beginning. And when they think the worst may be over…it’s just getting started. The action thriller “San Andreas,” from New Line Cinema and Village Roadshow Pictures, reunites Dwayne Johnson with director Brad Peyton and producer Beau Flynn, following their collaboration on the global hit “Journey 2: The Mysterious Island.” The film also stars Carla Gugino, Alexandra Daddario, Ioan Gruffudd, Archie Panjabi, Hugo Johnstone-Burt, Art Parkinson and Oscar nominee Paul Giamatti (“Cinderella Man”). “San Andreas” is produced by Beau Flynn. Richard Brener, Samuel J. Brown, Michael Disco, Toby Emmerich, Rob Cowan, Tripp Vinson and Bruce Berman are the executive producers. The screenplay is by Carlton Cuse, story by Andre Fabrizio & Jeremy Passmore. The director of photography is Steve Yedlin; production designer, Barry Chusid; editor, Bob Ducsay; VFX producer, Randall Starr; VFX supervisor, Colin Strause; costume designer, Wendy Chuck; and composer, Andrew Lockington. New Line Cinema presents, in Association with Village Roadshow Pictures, a FlynnPictureCo. Production, a Brad Peyton Film, “San Andreas.” It will be distributed by Warner Bros. Pictures, a Warner Bros. Entertainment Company, and in select territories by Village Roadshow Pictures. Rated PG-13 for intense disaster action and mayhem throughout, and brief strong language.